1/4 Page - 4.25" x 5.5"
1/4 Page Wide - 2.75" x 8.5"
1/2 Page - 5.5" x 8.5"
1/2 Page Wide - 4.25" x 11"
1/3 Page - 3.66" x 8.5"
1/6 Page - 3.66" x 4.25"
1/6 Page Wide - 2.83" x 5.5"
1/8 Page - 2.75" x 4.25"
1/8 Page Wide - 2.125"x5.5"
One of our biggest sellers is the standard 4" x 6" Postcard. 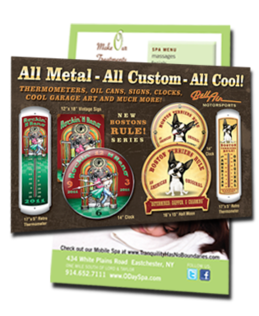 We print 4x6 postcards on our 10pt cardstock or our premium 16pt cardstock. its a great size for custom flyer printing and can be used for promotions, business announcements, sales events and as counter cards. When used as a mailer, custom printed 4x6 postcards receive a special postcard postage rate with the USPS. If you are looking to print and mail postcards, our in-house direct mail services team at America's Mailer can process your list and deliver your postcards too!